The World Transformed 2018 is just around the corner. It has already generated much excitement in left circles with its scheduled workshops and speakers. One featured guest has especially drawn a spotlight: Jean-Luc Mélenchon, leader of La France Insoumise, who gained 19.58% of the vote in the first round of the 2017 French Presidential election. While both Mélenchon and Jeremy Corbyn are seen as having shaken up the establishment by tapping into mass discontent with the neoliberal status quo and putting forward redistributive programmes, our attitude to Mélenchon should not be adulatory. For all its appeal amongst socialists and social democrats, Mélenchon’s political project is essentially populist nationalism with a left-wing sheen. While I welcome the British left’s opportunity to engage with the political current Mélenchon represents, it must come from a critical perspective. Mélenchon speaks of re-founding France into a ‘Sixth Republic’, but does so by appealing to patriotic sentiments rather than by calling for solidarity between workers and oppressed groups. He frequently denounces the European Union and Germany, as well as the destructive effects of capitalist competition at the international level, yet largely ignores the exploitative role of France’s own capitalist class. Indeed, when addressing attacks on workers’ rights, Mélenchon tends to demand various protectionist measures against foreign outsourcing instead of invoking the French left’s long-established slogan ‘Outlaw redundancies!’, which workers of all nationalities in France could raise against bosses of all nationalities. Mélenchon’s rhetoric thus revives old Gaullist themes of strengthening French national sovereignty and turning France into a counterbalancing geopolitical force against the US. This emphasis on French ‘national interests’ is the reason for which organisers at Mélenchon’s rallies actively reject the Red Flag and L’Internationale in favour of the Tricolore and La Marseillaise. Mélenchon’s focus on ‘the nation’ has at times slid into naked appeals to chauvinist prejudice against ethnic minorities. I believe he has courted anti-Muslim racism by entertaining the introduction of veil bans and accusing a centrist Jewish politician of thinking “in international finances, not in French”. One can further see Mélenchon’s drive to tap into French patriotism rather than build international working class solidarity in how he approaches the problematic aspects of France’s past. Like the right-wing Law and Justice government in Poland, Mélenchon engages in a nationalist politics of memory by denying any French responsibility for historical collaboration between the Vichy regime and Nazi Germany in World War II. Similarly, in response to anti-imperialist criticism of France, he declared that France “is universal because it is present on five continents”, quietly ignoring that this ‘universal’ presence is itself a legacy of the French Empire. To contextualise this refusal to engage with the less savoury aspects of France’s past, in several instances, the French political figures who collaborated with Nazi Germany and those who committed imperial atrocities abroad were identical. For example, Maurice Papon, the Vichy civil servant who organised round-ups of French Jews, also organised the massacre of Algerian demonstrators on the streets of Paris in 1961. Trade unionists also have little reason to have confidence in Mélenchon’s populism. During the major strikes and protests by French rail workers earlier this year, La France Insoumise proposed to have a large rally on the weekend so that those who could not strike, including small business owners, would be able to attend and raise the slogan ‘Macron: one year is enough!’. This choice to build a broad, cross-class coalition instead of strengthening bonds of solidarity between workers across different industries and expanding the disruptive effect of the strike reflects how much Mélenchon’s brand of ‘left’ politics has abandoned class struggle. 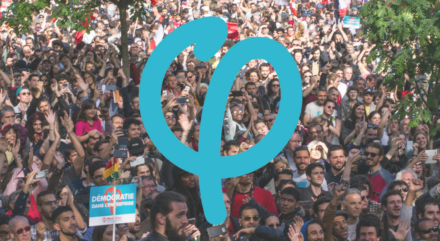 None of the above should come as a surprise given Mélenchon’s history of working with the French Communist Party (PCF), which has often appealed to nationalist sentiments at the expense of working-class solidarity. This track record includes an egregious occasion in 1980 when, in the name of preventing ‘social dumping’, the PCF mayor of Vitry led a gang of men with a bulldozer to destroy a hostel that was housing Malian immigrants. Nor should there be much surprise given Mélenchon’s own roots as a careerist in the French Socialist Party who served in several centre-left governments before establishing a new party with himself as leader. This is where the crucial difference between Mélenchon and Corbyn lies. Whatever their superficial similarities, Corbyn is a figure who consistently followed his conscience for many years as a party backbencher until his views found such unexpected resonance amongst Labour members and supporters that he was catapulted into the leader’s office. This is why, despite the serious limits I see in Corbynism as a political project, I have far more respect for a principled leftist like Corbyn than I do for Mélenchon. Dan Davison is a Cambridge-based activist in the University and College Union (UCU).